Putting items for sale on eBay isn’t a problem if you have the time to learn the eBay system. 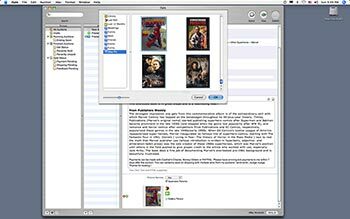 But if you simply want to put up an auction quickly and easily, Equinux has you covered with iSale 2.0. iSale is an auction-listing program that—with the help of iPhoto—makes auctions simple and easy to handle for the average eBay-er. But simplifying the auction-listing process isn’t without problems. iSale is missing some features that may put a wrinkle in your auction plans. At the heart of iSale is its slick appearance and ease of use. 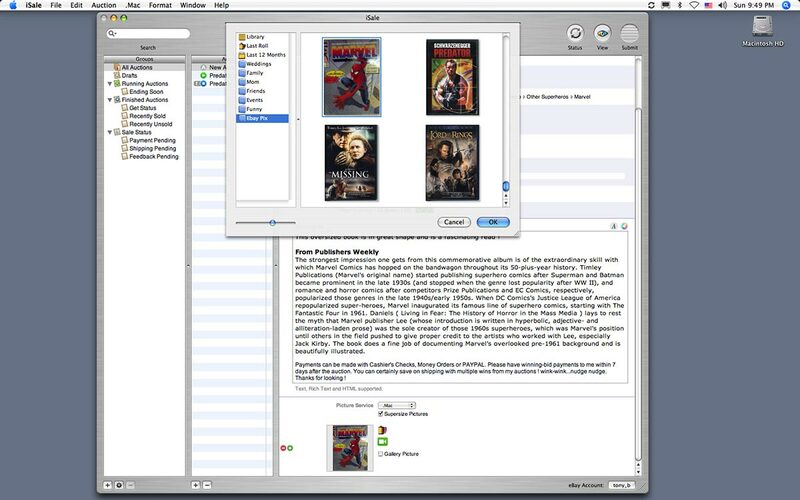 Similar to iTunes, iCal, and iPhoto, iSale’s interface contains a main window with a column on the left to show folders and groups. The main window shows the auction workspace. iSale also works with iPhoto to beautify your auction listings. To insert a picture into my auction, I just selected a photo from my iPhoto library. You can also take a new photo with an iSight Web cam and even host the auction photos on your .Mac HomePage. Much like the interfaces of iTunes, iCal, and iPhoto, iSale’s interface has a main window with a column on the left to show folders and groups. The main window shows the auction workspace. After entering all the auction information in iSale, you can then preview it to see what it will look like when it’s posted on eBay. From there, iSale will tell you if you forgot any required information and show you what the eBay fees will be. This is a great feature that prevents you from having to edit the listing after it’s posted. Once the auction is submitted to eBay, iCal will automatically follow the auction for its duration. 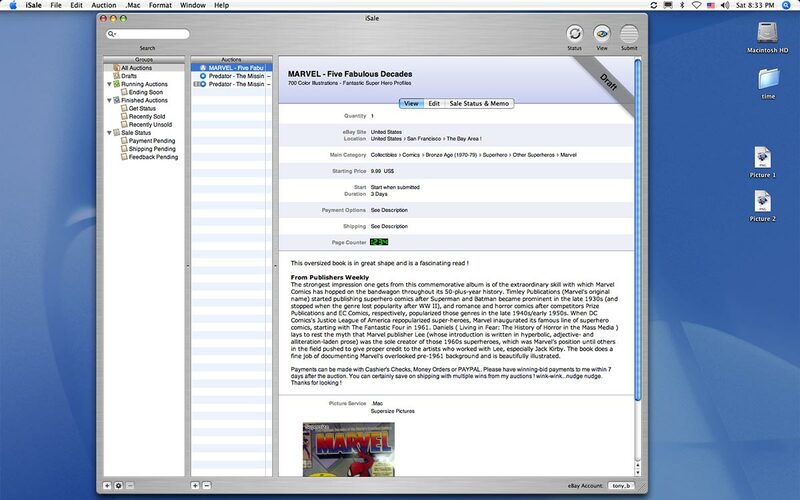 This dynamic integration between applications makes the auction process painless. iSale also benefits from core Mac OS X 10.4 (Tiger) technologies. There is a Dashboard widget to track your auctions and a live Search feature that works like Spotlight to search auction listings. Listing directly on eBay has an edge over using iSale in a few key ways. For example, iSale doesn’t have any design templates to spice up otherwise generic listings so you can differentiate your auction from others. And unlike eBay, iSale doesn’t support a one-day auction listing. iSale can include photos from your iPhoto Library in your auction listing. This is important for time-sensitive auctions that might require a fast turnaround, such as tickets to sporting events and concerts. For auctions of CDs, video games, DVDs, and books, you can enter the UPC or ISBN number and eBay will fill in all the details and insert the item into the auction. This is a handy feature that saves plenty of typing time. iSale provides an easy way to hop aboard the auction train. Users familiar with OS X and iLife will be able to jump in and start posting listings right away. Advanced users with high-volume auctions and specific needs will want to continue listing from within eBay.